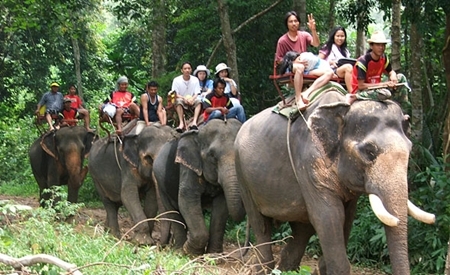 Elephants, mascots of Koh Chang, right now are poised to take you to explore the nature of the island. 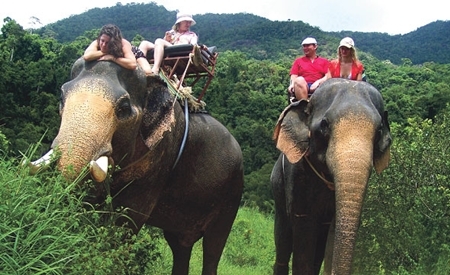 The glamour of riding an elephant has always been an unforgettable memory and gives tourists a chance to experience another aspect of nature. 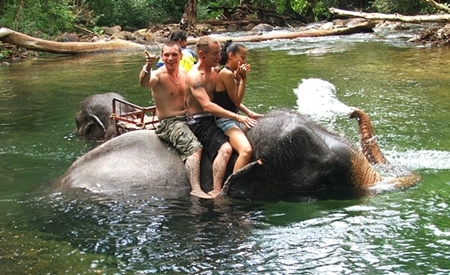 The journey starts by climbing up on an elephant at a boarding point heading towards the Khlong Phlu Waterfall. 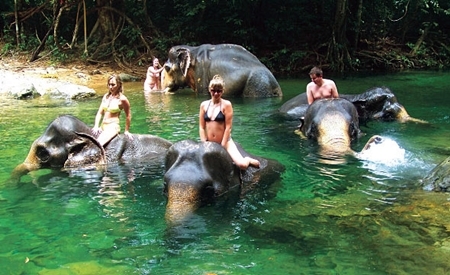 Along the way, tourists can have a great time exploring the beauty of nature on Koh Chang, passing rivers and mountains. The majority of Koh Chang is tall and steep, widely covered by a rich tropical forest that consists of many rare tropical plants. It is also an origin of many streams and is a habitat for many types of wild animals. During the journey, you can have a great time with many of the activities along the way; such as bathing the elephant, and training the elephants to transport lumber. When you reach the waterfall, you would have to get off the elephant and travel by foot along the stream and even climb some rocks to get to the waterfall. It does not take very long to get there. The Khlong Phlu Waterfall is the biggest waterfall on the island of Chang, which has water pouring down from it throughout the whole year; therefore, it is a good place to observe nature. 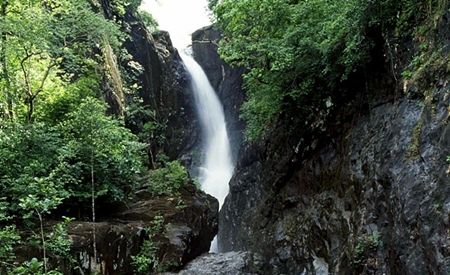 You will be surrounded by a rich tropical rain forest with many rare tropical flora, such as orchids and wild ferns. The highest level of the waterfall has water pouring from a cliff about 30 m high down into a large pond that is free for all people to play in. There are 4-5 boarding ports for the elephants, and each port has different paths and activities. Please: Do not bring any containers that are made of foam or plastic into the National Park. Travel Info: On the western side of Koh Chang, lots of local buses can take you there. Facilities & Services: Tour guide, elephant, restroom and parking. There are 2 categories of elephants in the world, Asian and African elephants. The Thai elephant is in the category of Asian elephants, elegant in feature and smart. The skin color is usually grey mixed with light yellowish brown. The skin wrinkles are smoother than those of the African elephant. Its tail has many short-haired tassels. From the front, the head is in triangular shape with 2 hemispherical bulges on the forehead. The trunk is beautifully round and not pointy. They eat approximately 250-kilograms of food every day. Thai elephants walk slower and are shier than African elephants. Their average lifespan is around 80-90 years. 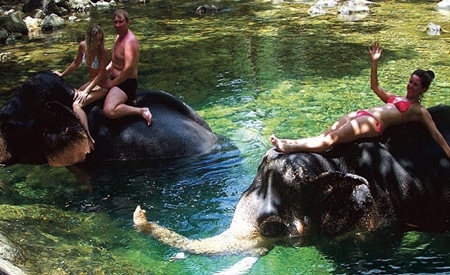 In Thailand, there are wild elephants in most regions with abundant forests with creeks and streams as they like to often take a bath and are good at swimming.